Do you need to brush up on your statistical skills to truly excel in your economics or business course? If you want to increase your confidence in statistics then this is the perfect book for you. 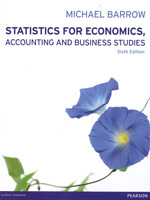 The 6th edition of Statistics for Economics, Accounting and Business Studies continues to present a user-friendly and concise introduction to a variety of statistical tools and techniques. Throughout the text, the author demonstrates how and why these techniques can be used to solve real-life problems, highlighting common mistakes and assuming no prior knowledge of the subject. Precisely what is a confidence interval? Are the test procedures valid? What determines the birth rate in developing countries? What determines imports into the UK?